The innovative Shure A56D Drum Microphone Mount sets a new standard for versatility. Compact in design, the A56D can be used in a multitude of positions for accurate microphone placement. 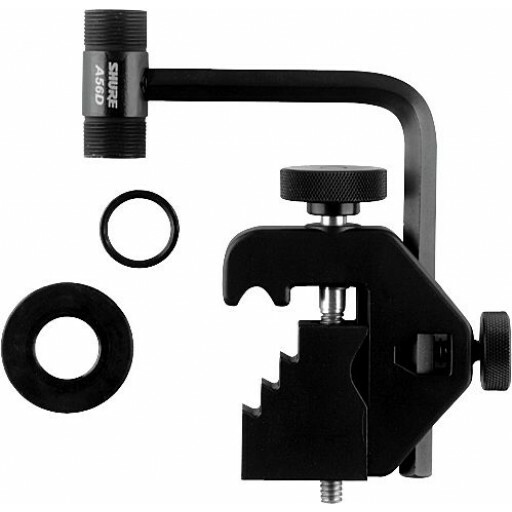 Live, or in the studio, this universal clamp can be mounted virtually anywhere, including drum rims and racks, microphone stands, and cymbal stands. This reduces the stage clutter that is associated with traditional mic stand set-ups, while promoting greater placement accuracy. Designed with captive parts to prevent the loss of individual pieces, the A56D is small, secure, and sturdy, and can be used with standard end address microphones such as the Shure Beta57, Beta56, SM57, and PG57, making it a great tool for both musicians and sound engineers. Available individually or as part of the DMK57-52 Drum Kit.